First, though, let’s back up a second — exactly what is gochujang paste? Sometimes referred to as the “spicy miso of Korean cooking“, gochujang is a fermented red chile paste that is a staple in Korean cooking. It is a thick and very-concentrated condiment that usually comes in a little tub or bottle. And it has this complex spicy, savory, sweet, funky, umami flavor that instantly livens up any dish. When I was visiting Korea this month, gochujang was served with almost every meal, and it’s the signature flavor of many traditional dishes there, including the ever-famous bibimbop. Protein: I stir-fried some steak with a bit of garlic for the lettuce wraps in these photos. 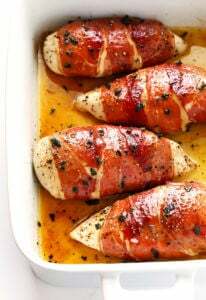 But ground beef, chicken (sliced chicken breasts or ground chicken), pork (sliced pork chops or ground pork), shrimp, or tofu would also be delicious here. Veggies: I kept things simple with thinly-sliced carrots and cucumber. 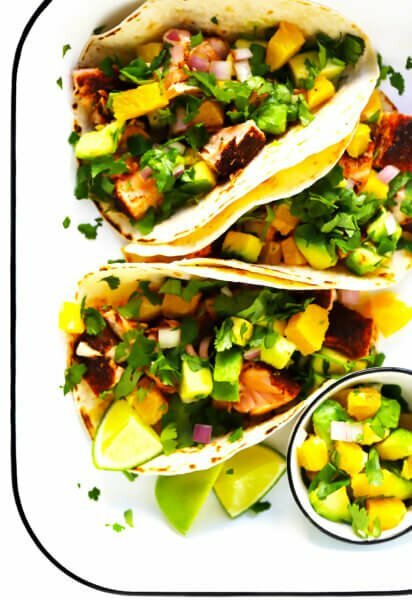 But any additional lettuce-wrap-friendly veggies would also be delicious here, such as radishes, bean sprouts, bell peppers or avocados. 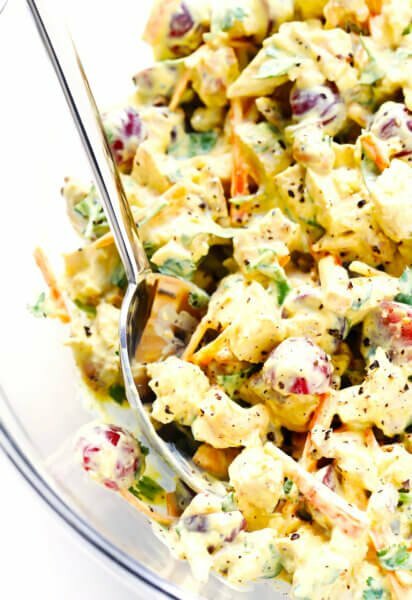 Lettuce: I used butter (bibb) lettuce leaves, but romaine, iceberg, cabbage, or endive would be delicious alternatives too. 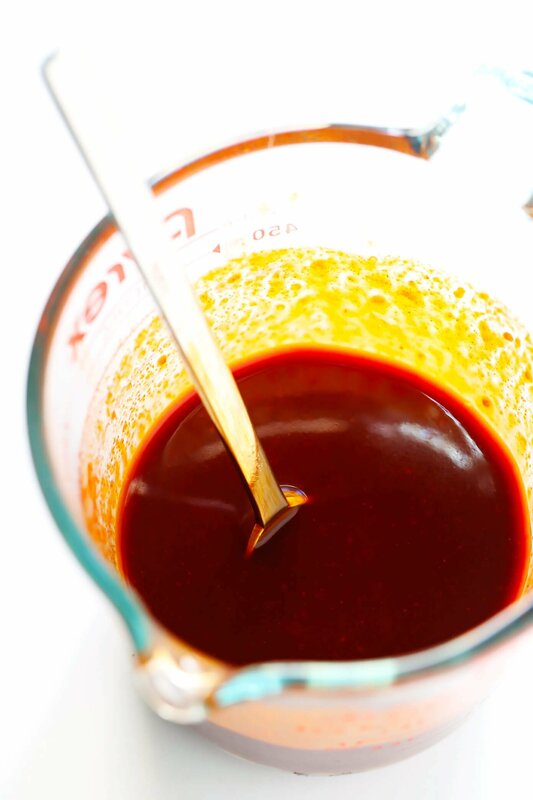 Sauce: Our 4-ingredient sauce simply calls for gochujang paste, soy sauce, maple syrup (or honey or brown sugar), and toasted sesame oil. Garnishes: I just sprinkled some toasted sesame seeds and thinly-sliced green onions on my lettuce wraps. But feel free to add on any other garnishes that sound fun! Chop the veggies. You can shred, slice or dice them into whatever shapes you prefer. Make the sauce. In a small bowl, whisk together the four sauce ingredients until combined. Give it a quick taste and feel free to add more sweetener and/or gochujang if you would like. Cook the protein. Season your chosen protein with salt and pepper. Then I recommend just stir-frying it in a tablespoon or two of oil until it is cooked. Remove the pan from the heat, then toss the protein with half of the sauce. Make them spicier: If you want an extra kick, feel free to add in a little extra gochujang and/or mix some crushed red pepper flakes in with your sauce. Make them milder: If your sauce accidentally packs too much of a punch, feel free to tone it down by adding in more of the other ingredients (especially maple syrup). Or another random trick — stir in some ketchup! Its vinegar and sweetness will help balance things out a bit. 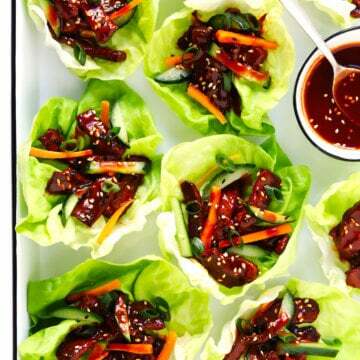 Add rice or grains: To make these lettuce wraps a bit more hearty, feel free to also add in some cooked rice or grains. Add nuts: This isn’t traditionally Korean, per se, but I love always love sprinkling some chopped peanuts on top of my lettuce wraps. Add citrus: For a sweeter spin, feel free to also add in some chopped apple, pear, or grapes. If you’re looking for some more inspiration, here are a few of my favorite Korean recipes! 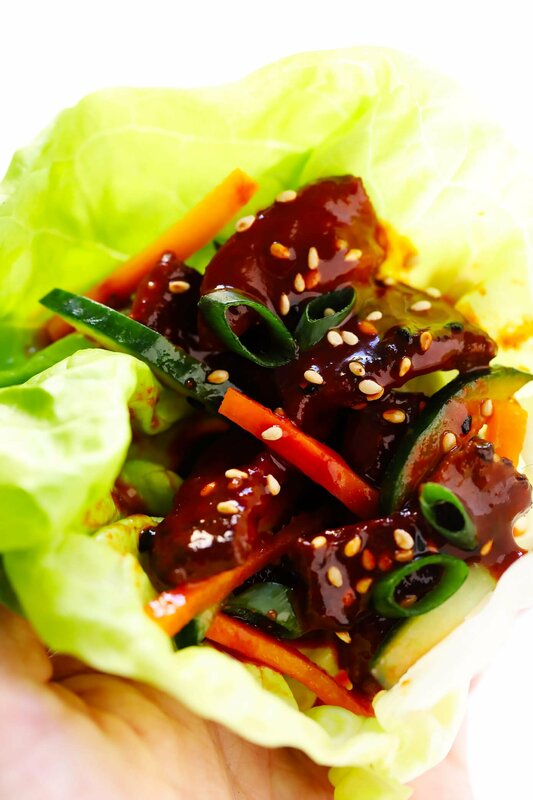 This quick Gochujang Lettuce Wraps recipe is easy to make in about 20 minutes with the most delicious 4-ingredient gochujang sauce, plus your choice of protein and veggies. Make the sauce. Whisk together all sauce ingredients in a small bowl until combined. Taste and add any extra maple syrup (to sweeten) or gochujang (for spice) if would like. Cook the protein. Season the steak (or your preferred protein) with a few generous pinches of salt and pepper. Heat oil in a large sauté pan or wok over high heat. Add the steak and garlic and sauté for 4-5 minutes, stirring occasionally, until the steak is browned and tender. 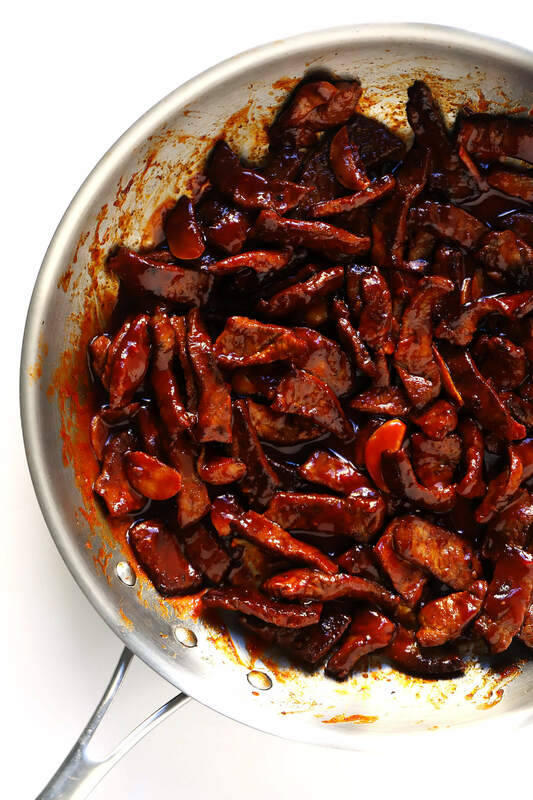 Remove pan from heat and stir in half of the gochujang sauce until it has evenly coated the steak. Assemble the lettuce wraps. 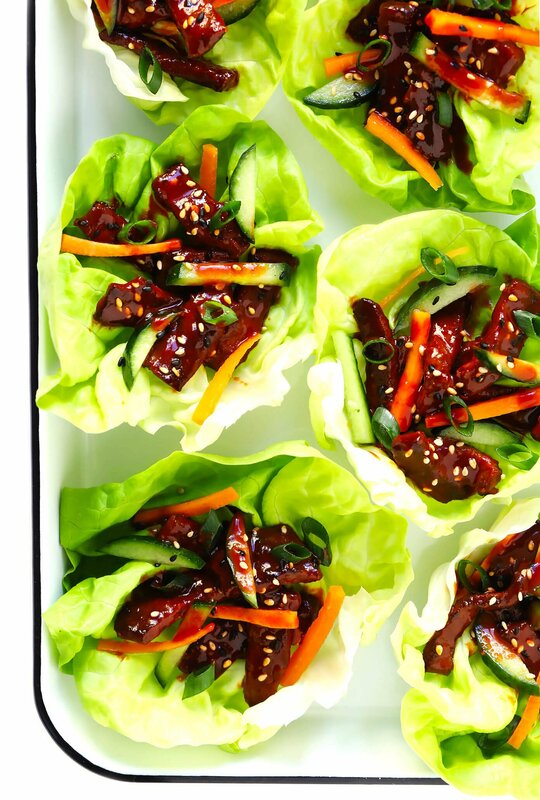 Portion a spoonful of the saucy steak into each lettuce cup, topped with a few cucumbers and carrots, an extra small drizzle of the remaining sauce, and your desired garnishes. Protein: Feel free to stir-fry 1 pound (more or less) of any of the following proteins. Cooking time will vary a bit according to whichever protein you choose, but just stir-fry until it is cooked through. Fun! I love gochujang! First tried it with blue apron meals, and now I can’t get enough. I suggest adding cilantro as a topping, if desired. thank you. I will try it today! Can’t wait to try this recipe! I actually just bought a jar of gochujang last week and have been looking for recipes to use it up so this is perfect timing for me! Do they use it as a condiment or just in cooking meals? I made this tonight and love it!!! Love the sauce, thanks for the heads up on which paste to buy. Does the paste need to be refrigerated after opening? I made this last night and they were delicious! 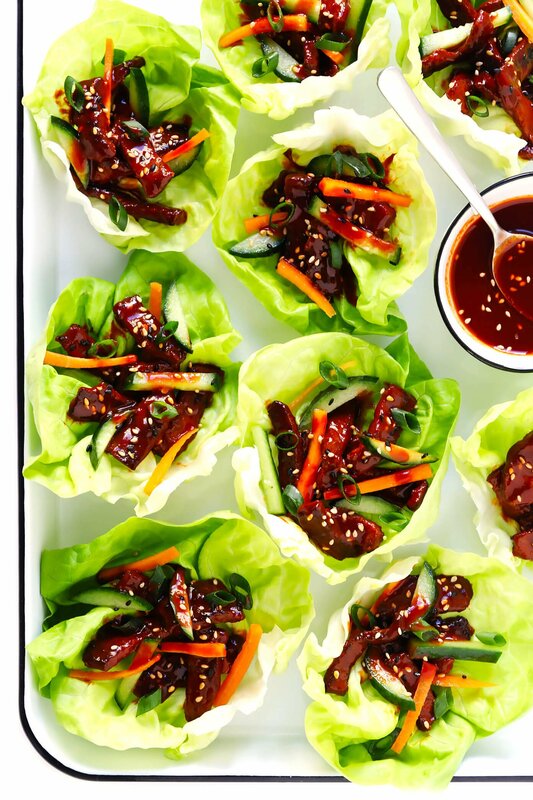 Even the fiance who was wary of lettuce wraps – loved them. I did add rice into wraps for a little more hardiness but kept mine grain free. I think the game changer for me was that I pickled carrots, radishes, and cucumbers for about 2 hours before serving in the wraps! And in case anyone wants any more ideas, I had the gochujang steak and pickled veggies over a spinach salad the following day and it was AMAZING! Thanks Ali!